If you think Big Social Media is strangling free speech, or you’re just fed up with being the product, or you are realizing what privacy you’re giving up by using them, or you’re just tired of them lying about all of that; you might find this article of interest. Most of those skeptics promote a distinction between free speech and “hate speech,” a term Mr. Zuckerberg has yet to define for us; but he’s working on an AI to apply the definition he comes up with: Once all those messy linguistic, contextual, semantic issues humans can’t even deal with are programmed. That is, he dreams of automating enforcement of Silicon Valley values conforming to regulation he’s requested from our technology-naive and Constitutionally slipshod Congressional placeholders. They’ll be looking to erect an emanating penumbra since: No, there’s no “hate speech” exception to the First Amendment. They have to help Mr. Zuckerberg add one. We can look to George Orwell for insight into how that public/pirate partnership is likely to work out. Very Liberal students care far less about giving offense than about being judged. That is, they worry more about tribal membership in-good-standing and find it implausible their opinions would offend anyone. A collectivist approach. 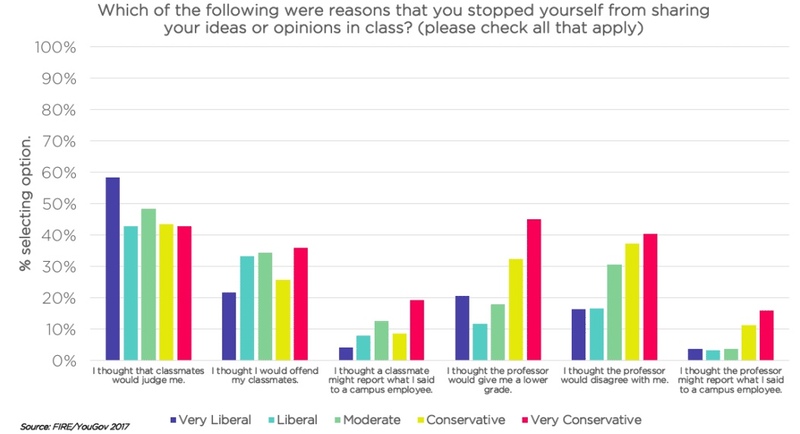 Conservative students are much more concerned about campus thought police than Liberal students. I would have liked to see them less concerned about giving offense to peers as an indication of individualism, but they know they are surrounded by a great number of people who easily take offense. And they are probably just more polite. Here’s another post I think helps explain why Liberals don’t like free discussion of ideas. They mean well, but can’t be bothered to examine consequences in their quest to perfect the rest of us. Mark Steyn had exactly the same reaction I did. I watched some bits of Zuck’s testimony on Fox News because I wanted to see the bland boy-face of evil and I wasn’t disappointed. He performed magnificently enough that my wife became pissed off at me for yelling at the TV. The snippet Steyn notes provoked my second loudest yell and an admonition to stop ranting. On Fox, this bit came before the weaseling he did under examination from Ted Cruz, when I erupted with my loudest commentary. My wife changed the channel at that point. Zuckerberg’s intentions are what he thinks makes him a misunderstood white hat. 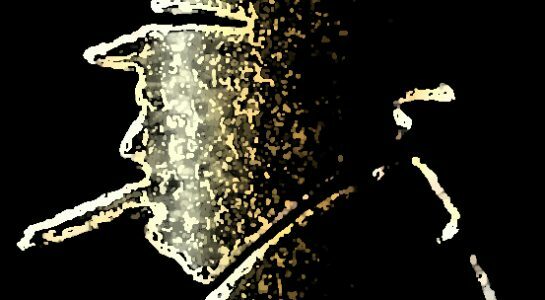 In his ignorant isolation he truly thinks his intentions are good: That is what makes him evil. When he speaks about “protecting the “community”” he sneeringly arrogates moral superiority, and is too ignorant to even recognize it. When he speaks about “protecting the electoral process” he is saying “War is peace. Freedom is slavery. Ignorance is strength.” He had no concern about “protecting” the 2012 election, when his company actively aided Obama. So be it, as long we as define that as campaign “contribution in kind,” but stop with the maternalistic condescension. Zuckerberg said it would be hard to pin down a specific definition, and mentioned speech “calling for violence” as something Facebook does not tolerate. Does anyone at Facebook understand the ramifications of a vague definition of hate speech? Does Zuckerberg think that the sometimes-violent opposition to any viewpoint that is even remotely conservative on college campuses happened in a vacuum? He’ll be using Fahrenheit 451 as the instruction manual. And on that, Facebook stock rises. We are dumb f**ks. This means “may guess at,” based on an algorithm. Twitter has a right to do this, but does that make it a company you want using you as its product? Whether you imagine Barack Obama or Donald Trump as evil incarnate, can you imagine what the Feds might do with such a list? Add you to NICS as “prohibited”? Trigger an IRS audit? Identify who uses the term “undocumented migrants?” Well, that last wouldn’t be on Twitter’s list, of course. That was actions both on and off Twitter. With a single verdict, Twitter has saddled itself with an incredible responsibility. It not only plans to police its users while they’re using the aid. Now it has to police them when they’re not on Twitter, too. Does it include attending a rally in real space? Facial recognition software makes that quite conceivable. You also may not affiliate with organizations that — whether by their own statements or activity both on and off the platform — use or promote violence against civilians to further their causes. See, this is why defining speech they dislike as literal violence is so important to the SJWs. Note that it appears to be OK to promote violence against the military or police. …you give the amoral profiteers more psychological leverage. It isn’t hard to imagine a version of Google Glass that tracks eye movement, pupillary diameter, and even heart rate from the blood vessels in your eye – then they’ll be guessing your thoughts. And then check out gab.ai.